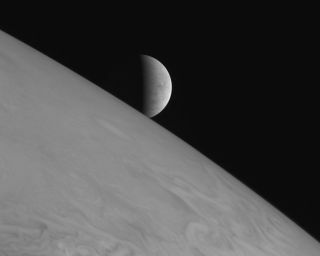 The icy moon Europa rises above Jupiter's cloud tops in this photo taken by New Horizons with its Long-Range Reconnaissance Imager (LORRI) on February 28, 2007, six hours after the spacecraft's closest approach to Jupiter. There is an ocean beneath the icy crust of Jupiter's moon Europa. Strange creatures could be swimming in these alien waters, but so far no missions have been sent there to investigate this possibility. Our closest view of Europa was provided by the Galileo spacecraft, which orbited the Jupiter system from 1995 to 2003. Now researchers are developing a new plan to study the moon with even greater detail. The Europa-Jupiter System Mission (EJSM) calls for one spacecraft to orbit Europa and another to orbit Ganymede, another large moon of Jupiter that also may have a liquid ocean locked beneath an icy outer layer. EJSM would be a joint mission of NASA and the European Space Agency, with ESA in charge of the Ganymede orbiter and NASA directing the Europa orbiter. Working together, the two spacecraft also would be able to conduct limited studies of the large moons Io and Callisto, as well as the planet Jupiter. Brad Dalton of NASA's Jet Propulsion Laboratory, who is helping draft the EJSM proposal, says some of the instruments the Europa orbiter will carry include a camera, a spectrometer, and a powerful radar system. The radar would enable the spacecraft to peer through Europa's ice and figure out just how thick it is. The Ganymede orbiter also would carry a camera and spectrometer, as well as a dust analyzer, mass spectrometer or magnetometer -- instruments that could be used to study the surface composition of Ganymede and the surrounding space environment. "The Ganymede orbiter will be more concerned with overall geophysical processes, from the interior to the magnetosphere," says Dalton. "The Europa orbiter design is driven in part by the astrobiological significance of the Europa ocean, so it will be focused more on direct evidence for the ocean and the tidal flexing that keeps it liquid." Scientists have dreamed of sending a surface lander or even a submarine to investigate Europa's ocean, but Dalton says the current vision for EJSM does not include any such instrument. This mission could answer the question of whether there is life on Europa by analyzing the ice shell. The underlying ocean on Europa occasionally wells up out of cracks in the ice shell and washes over the surface, erasing features like impact craters. If life is carried in these waters, then their remains could now be frozen in the ice and an orbiter could detect them. The orbiter would have a tougher time finding evidence for life if it is confined to the bottom of the ocean. Some scientists think the origin of life on Earth occurred at volcanic vents in the ocean. They suspect Europa has similar volcanic activity thanks to the gravitational influence of Jupiter, which squeezes Europa as it orbits from one side of the planet to the other. This "tidal flexing" should keep Europa's core molten and result in volcanic activity – just look at Europa's neighbor Io as an example. Io orbits even closer to Jupiter than Europa, and its surface is pockmarked with active volcanoes that spew sulfur and other chemical compounds into space. Many of these same compounds are found at Earth's hydrothermal vents, and may be associated with early life on our planet. Even if EJSM doesn't find direct evidence for life on Europa, it may be able to determine whether the moon is generally conducive to life as we know it. If EJSM finds that Europa's environment is habitable, says Dalton, then "that improves our prospects for searching later with a landed system." Of course, EJSM could determine that Europa is inhospitable to life. Yet Dalton says even if the evidence suggests Europa is a dead moon, that still won't be the final answer about the possibility for life on Europa. "As with Mars, where we have not yet found any evidence of life, there are still many ways life could exist there," he notes. "EJSM will help us narrow down the possibilities so we know where to look closely. There is so much we don't know about Europa yet." NASA and ESA are currently trying to determine what the next outer planet mission will be. Competing with EJSM is TSSM, a mission to Saturn and its large moon Titan. The final selection will be made in early 2009 (the last meeting to pitch the projects was held in early November). Whichever mission is selected, the projected launch date is around 2020, with an arrival around 2030.